The estimated delivery time will be approximately 5 – 7 business days from the time of order. These high quality storage racks help to make your garage a more functional space for your vehicles and toys. 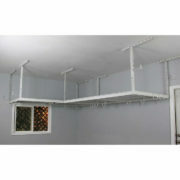 SafeRacks is designed first and foremost for maximum strength and durability. 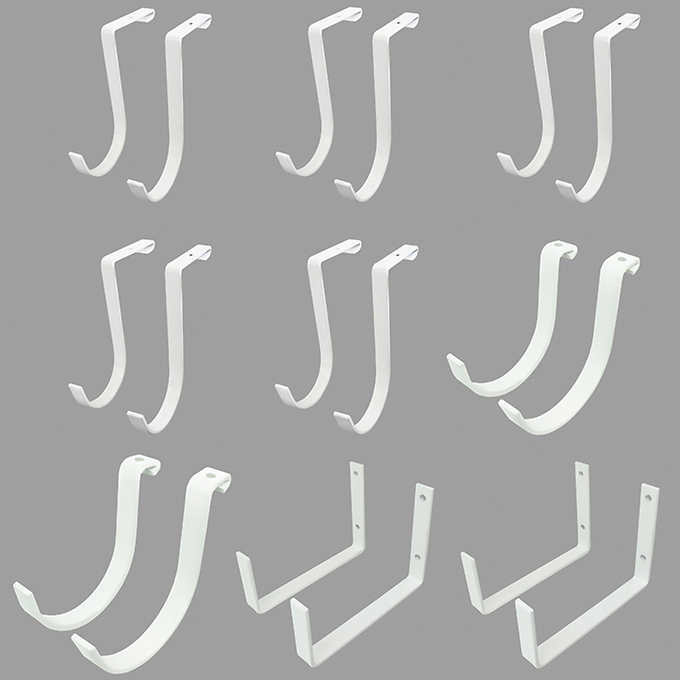 Each product boasts a heavy duty design and is manufactured with industrial grade steel. 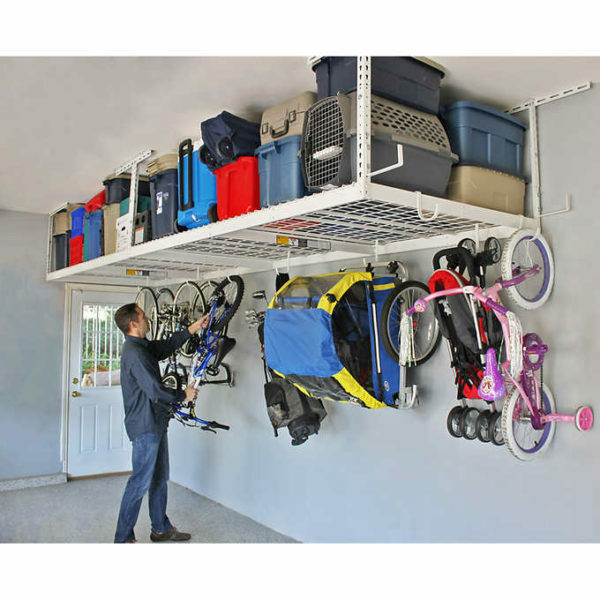 The support structure of each rack is independently tested to hold up to 600 pounds. 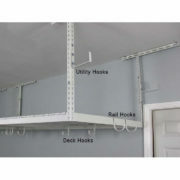 The accessory hooks included are great for hanging your items that need to be up and out of the way. You can hang many different items from these hooks including: bikes, golf clubs, strollers, gear bags, ladders, jackets, umbrellas, and much more. SafeRacks come with easy step by step installation instructions and there is an installation video below. How Do I Decide The Correct Drop Down Length? 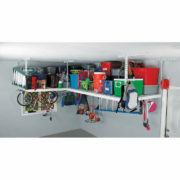 Answer: This varies per garage. Below are a list of variables to consider when determining the drop down length. What is the distance from floor to ceiling in your garage? 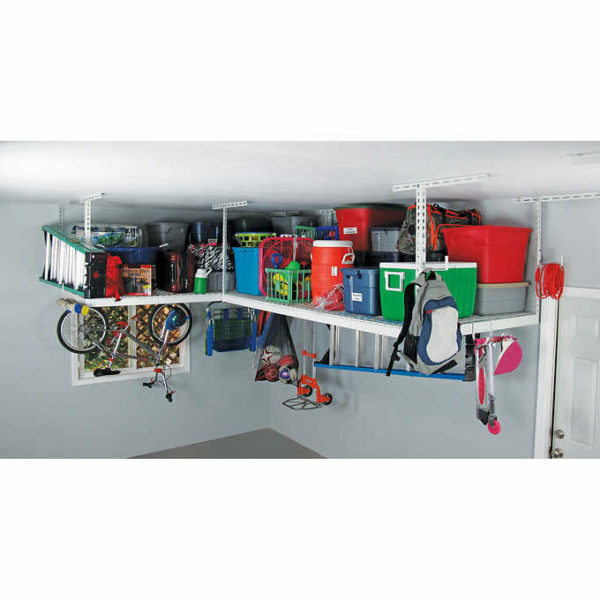 What is the distance between the garage door (when open) and the ceiling? 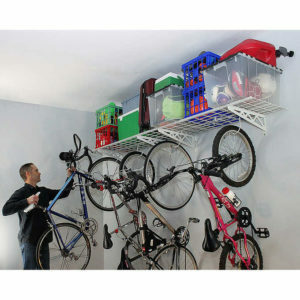 What items do you want to fit on the rack? 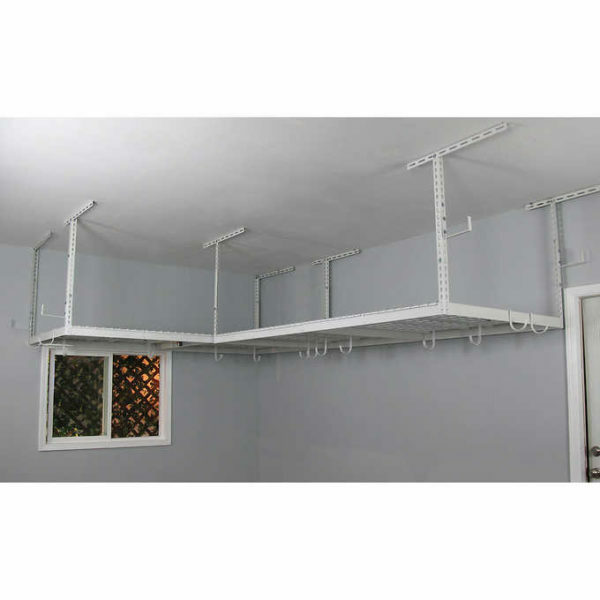 Do you need it to be above a door frame or work bench? What is the distance from your ceiling to the top of your car? Do you want to be able to hang items below the rack? The horizontal beam with the decking on top is about 3″ in height. 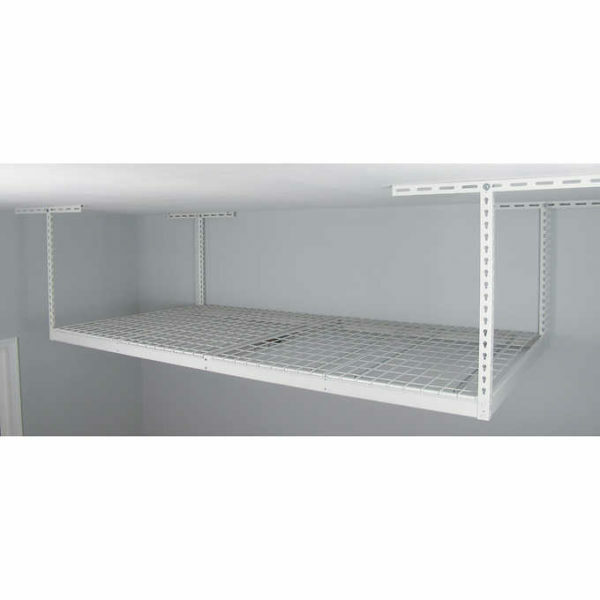 We recommend measuring the space where you want your rack to be installed so that you have a better understanding of which drop-down size to choose. Can I Install SafeRacks Into Metal Joists or Concrete Ceilings? 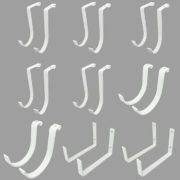 SafeRacks are designed to be installed into wood joists only. If your ceiling is dry-walled, use a stud finder to locate the joists. Can I Have SafeRacks Professionally Installed? 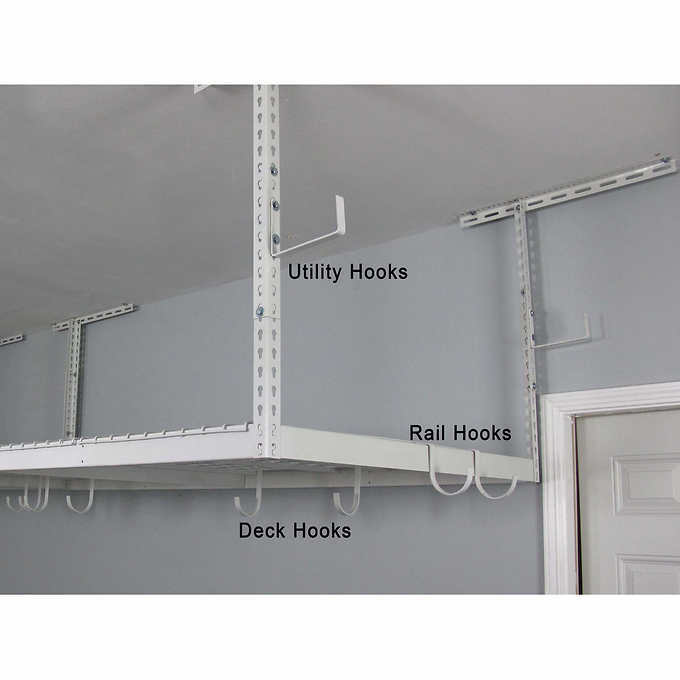 If you do not feel comfortable installing SafeRacks yourself: first, purchase them from Costco.com; second, contact SafeRacks to see if there is an installer in your area. Installation service is available in over 25 major cities across the country. To find a SafeRacks Installer call 877-655-3443 or visit SafeRacks.com. If an installer is not available in your city, you can find a reputable handyman on Angieslist.com, Homeadvisor.com or other trusted sites for finding home contract labor. Additional fees will apply for installation services. How Does This Ship To My House? Each Combo Kit is shipped in 3 boxes. Boxes may be delivered 1-2 days apart due to the different sizes of packages.